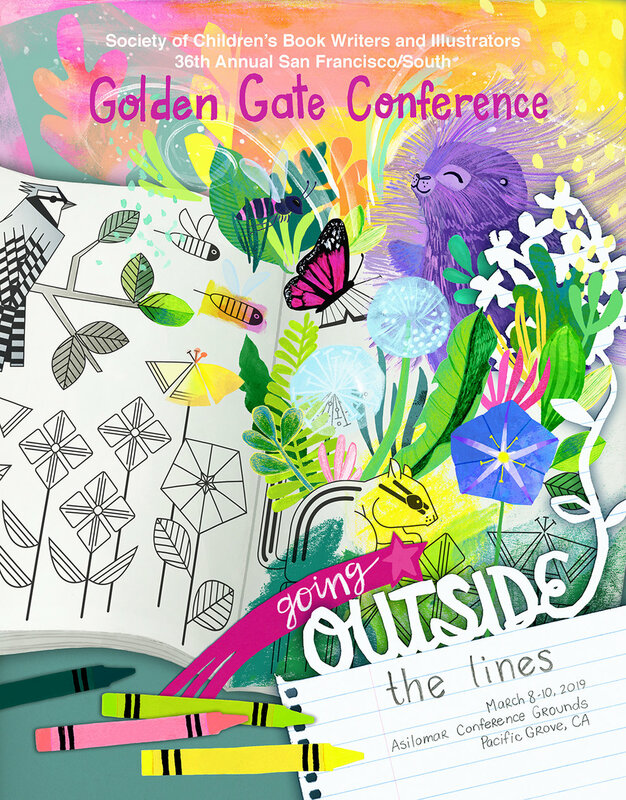 Here the folder I designed for SCBWI’s Golden Gate Conference. The theme was going outside the lines. All I could think about was a porcupine being a little, fuzzy, happy mess, living amongst orderly garden critters. I wanted to share the activities from my art show. You can view all the artwork for the activities here! Do your kids want to get involved in our Art Project for Rhinos and Pangolins? Our tiny activist requested that her rhino get eyelashes! Today I went to a local school and gave a presentation about orangutans to 2nd graders. The entire class was really interested in animals and how to help them which was great to see. You can download the Orangutan Ranger Worksheet I made them: here. See orangutan facts below. 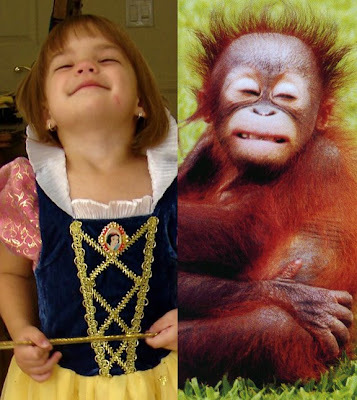 My little cousin and an orangutan from Sabah, with the same smile on their face! (Her mother did not appreciate this comparison, but I thought it was adorable). Orangutans only live on the two islands of Sumatra and Borneo in Southeast Asia. They live in the countries of Indonesia and Malaysia. They only live in tropical rainforests. Are orangutans closer relatives of humans or monkeys? Orangutans are closer relatives to humans than monkeys. Humans and orangutans share 97% of their genes. Both people and orangutans are part of the “Great Ape” family. Orangutans are so close to humans that they can even catch human diseases. What does the word orangutan mean? Orangutan means "person of the forest". Orangutan comes from the Malaysian words Orang meaning person and Hutan meaning forest. The first people who saw orangutans thought they were just hairy men who lived in the jungle. Where do orangutans sleep at night? Orangutans build nests high in the trees. Orangutans build a new nest every night to sleep in. Baby orangutans share a nest with their mother. How big do orangutans get? Male orangutans can get up to 260 pounds and as tall as five feet and 9 inches. Females orangutans can weight up to 110 pounds and get as tall as 4 feet and 6 inches. What are the orangutans favorite food? Durian, a large spikey fruit is the orangutans favorite food.Orangutans diet is made up as 90% fruit. Durian is a favorite fruit throughout Southern Asia but it is so stinky that many hotels and restaurants won’t let people eat them. What else do orangutans eat? Orangutans eat tons of fruit but they also eat leaves, seeds, bark and bulbs. Orangutans also occasionally eat termites and bugs and some smaller animals like fish like birds and small mammals. How old do orangutans get? Orangutans live 30 to 45 years in the wild. They can live up to 55 years in zoos. Yes, sadly orangutans are very endangered. What is the biggest threat for orangutans? Humans! People are the orangutans biggest threat. Forest destruction for agriculture, especially for palm oil. People also cut down trees to make timber and paper. Illegal pet trade is another problem that orangutans face. How many orangutans are left in the wild? Where can I adopt an orangutan?